Samford will again offer a full schedule of family-friendly Christmas events this year, all of which are free except as noted below. This celebration, one of Samford’s oldest holiday traditions, features invocations, hymns and scripture readings in 16 languages, ending with a group singing of Stille Nacht/Silent Night. 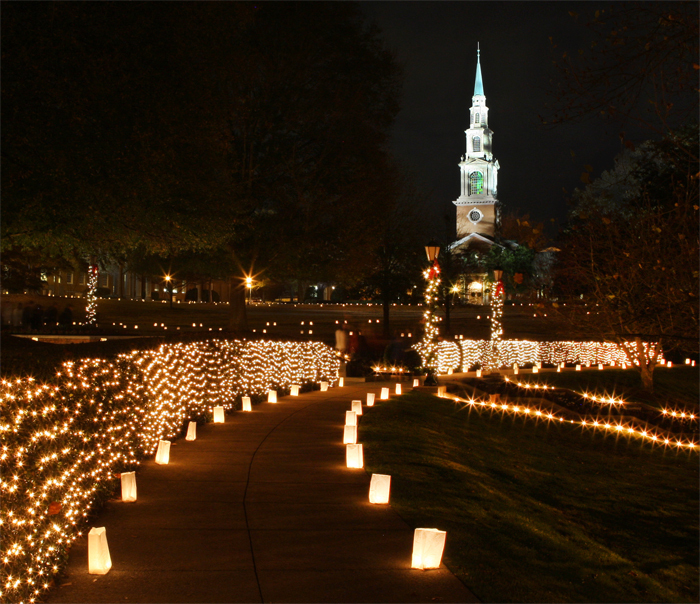 The music of University Chorale and the decorated, candle-lit Reid Chapel and Quad make Samford’s Hanging of the Green and Lighting of the Way a magical, memorable experience. Alumni and other friends unable to attend in person can watch streaming video. $12 (adults,) $9 (55+) and $6 (students/children) at (205) 726-2853 or online. Hansel and Gretel is the classic fairy tale opera by Englebert Humperdinck and Adelheid Wette, first performed at Christmas in 1893.The lively family production is a special musical treat for this year’s celebrations! Samford’s handbell ensemble presents an evening of beautiful music to set the mood for the sacred season. Dec. 6, 10 a.m.-2 p.m. and 4 p.m.-8 p.m.
Samford’s Legacy League will present a tour of the decorated homes of Beth and George Simpson, Dolly and Jim Walker and Jeanna and Andy Westmoreland. Holiday hors d'oeuvres will be served at the Westmorelands' home. Free shuttle service is available and encouraged. For schedule, tickets and other details, call (205) 726-2247. New this year, the School of the Arts Christmas Collage is a holiday extravaganza featuring the faculty and students of the departments of Visual Art, Interior Architecture, Music, and Theatre and Dance. Join us for a festive night of arts, food and fellowship! The popular multimedia presentation, "The Star of Bethlehem," presents scientific explanations for the famous star of the gospel of Matthew. All ages are welcome to the free event, but the show is most suitable for ages eight and above. Seating is on a first-come, first-served basis. No reservations are required, although groups of 10 or more may request a private showing. The 96-seat planetarium is wheelchair accessible and is located in Samford's Propst Hall.